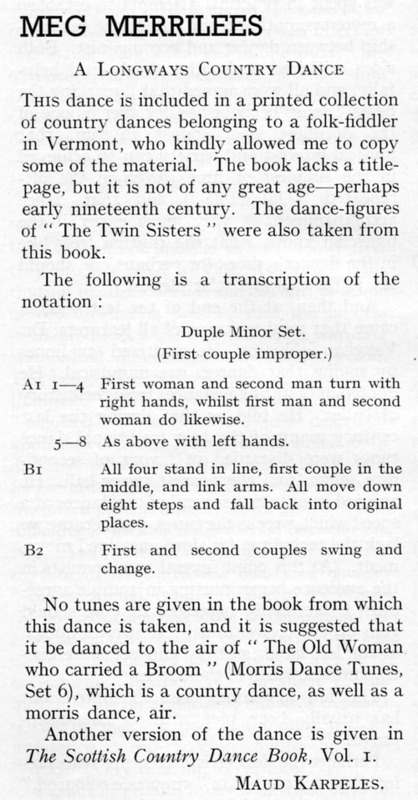 Source: Maud Karpeles; published in English Dance & Song, November 1936, Volume 1, Number 2. 24 bars. Maud suggests the jig "The Old Woman Who Carried A Broom". As Maud says, there is a Scottish version. It contains basically the same figures in the same order, but all of them slightly different from this version. One Scottish reference suggests that it was from 1827, which matches Maud's guess of "early nineteenth century", so the two versions may well have evolved from the same source material. Meg Merrilies was a character in Sir Walter Scott's "Guy Mannering", published in 1815. John Keats was travelling in the area where the novel was set, and wrote a song about Meg Merrilies in 1818. At least he calls it a song; I can't see a tune anywhere, so poem may be a more accurate description. The spelling is different, but the dance and the poem may be related.